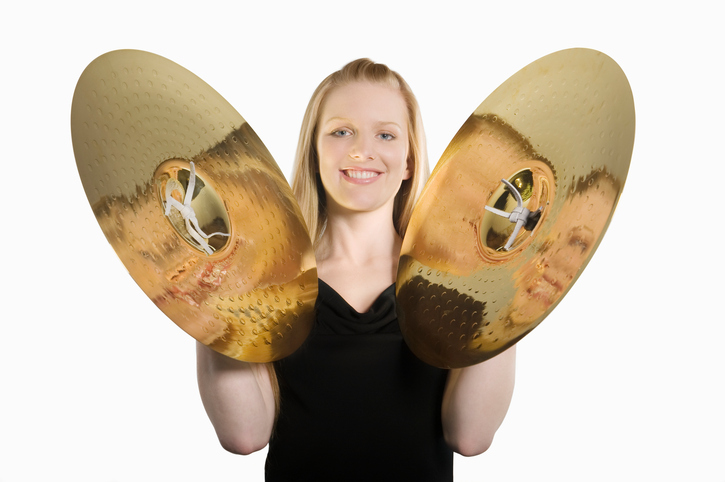 The clash of cymbals can be very loud! To clash means ‘to produce a very loud noise by collision’. It also means ‘to disagree’ or ‘to engage in physical conflict, whether in game or battle.’ If colors clash, it means that they don’t combine well. As a noun, a clash is a loud harsh noise, a conflict of interests, and a fight or contest. Mark and his brother don't get on; they are always clashing over something. Police clashed with protestors at today's demonstration. The English and French rugby teams are due to clash this weekend. You can't wear orange with bright pink; those colors clash! Madge heard the clash of the plate hitting the tiled floor. The papers reported another clash between the government and the opposition. There has been a clash between the army and enemy forces. In the dialect of Scotland and Northern England, a clash is also a sudden and heavy fall of rain. Clash, as a verb meaning to make a loud, sharp sound,’ dates back to the late 15th century. Its origin is imitative; in other words, it sounds like what it is, and it is a blend of the words clap and dash. Clappen is an Old English verb from a Germanic origin, while dash is from a Scandinavian source and came into English in the late 13th century. Both are also imitative. Clash is related to other imitative Germanic words, such as the Dutch kletsen (to splash or clash), or the German klatschen and Danish klaske (to clash or knock about). The figurative sense of the verb, referring to a non-physical fight, was first used in the early 17th century. The meaning related to things colliding is from the mid-17th century, and the figurative sense from this meaning, about colors, dates back to the late 19th century. The noun comes from the verb, and dates back to the early 16th century. The meaning ‘hostile encounter’ is from the mid-17th century, while the figurative meaning, ‘conflict of opinions,’ is from the late 18th century.